This colorful salad is dressed in delicate garlic and basil-flavored dressing. The lemon added in it gives an extra punch to the dressing and is an excellent source of vitamin C which helps in the absorption vital minerals from the diet. In case you don’t find fresh basil, use ¼ tsp of dried basil. Heat a nonstick pan, add the chopped garlic and sauté till it browns lightly. Stir in the basil leaves and mix well. Cool completely. Add the lemon juice, sugar substitute, salt, and pepper and mix well. 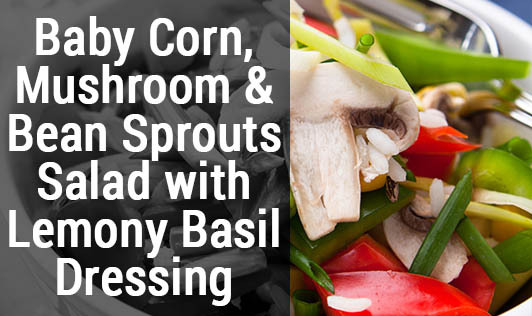 Combine all the vegetables in a bowl, toss lightly, and refrigerate. Just before serving add the salad dressing and toss well again. You can use honey instead of the sugar substitute. You can add nuts and seeds like walnuts, almonds, and sesame as well.